Dairy Free Betty: Getting back and a heart to heart. Getting back and a heart to heart. 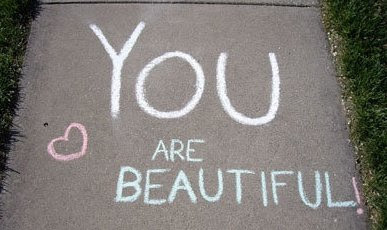 Yup, it's true you are... and so am I!!! Don't forget it! So on that note... so here is the heart to heart part.... it's really hard for me to say this out loud, but hey why not right? I've gained a bunch of weight lately. I haven't been active at all, and I haven't been eating as healthy as I should be and I miss it. My jeans are all tight, the scale is creaping up to a number that makes me unhappy, I couldn't get half way up the wall when I went rock climbing the other day, I am out of breath walking up hill and after a 45 min yoga class my body screamed and yelled at me for 3 days. Weight has been something I have struggled with my whole life, I was always the bigger girl in school, I got bugged and bullied quite a bit due to it. When I was into my "party girl" stage, I was usually the last girl in thr group any of the guys talked too... That stuff is damaging I tell you!! It's probably mostly in my head but even training for an 10km race, I still didn't feel "in shape", I felt like I accompolished great things but still didn't feel great. 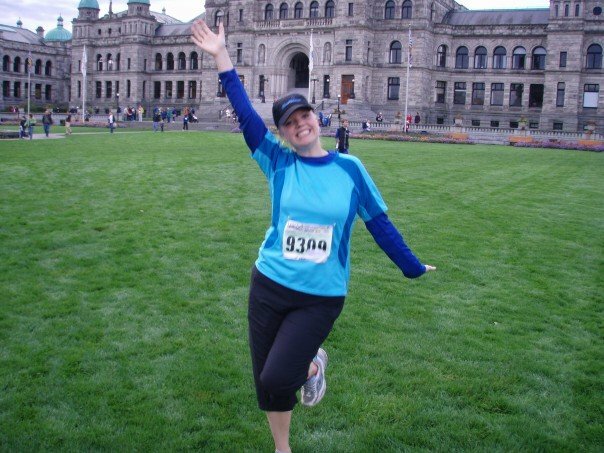 Here I am at the end of my first 8km race! The 10km race came a few weeks later (which was pretty easy too... the hardest challenge of it was having to dodge the 50,000 people in the race). I'm not sure I could have been happier here though, the race was a piece of cake!! I know I'm probably being to hard on myself, but I'm also just being honest. So it's time for a change... this morning I just did my own little thing and had fun doing it. I did 3x songs of arms with weights, 1 song of cardio, 1 song of hula hooping (ouch) and then about 20 mins of yoga. It's a start right? I'm not sure where to find my motivation to do all the other stuff I used to do, especially with the cooler/wet weather starting, but I'm going to try! Oh a fantastic note I had an AMAZIN G breakfast and 4 hours later I am still happily content. I haven't had oatmeal in forever, but after reading so many blogs I was re-inspired!! Ok the picture will only load sideways, even if I try to change it?? This has been happening lots... Any ideas? The oatmeal had crasins, pecans, peanut butter and 3 or 4 chocolate chips.. YUM!!! Anyways thanks for listening to me. I look forward to reading your tips and ideas. I also have a new email address so feel free to email me too! Ps. We're going for sushi tonight...... YUM!!!!!!!!!!! That was a great start!! Take it day by day girl - acknowledging that you want something to change is a great step! I know what you mean about the crappy weather - I haven't worked out in a long time! I need to get back out there (or somewhere) soon! Like now! getting started again is VERY hard. I think the hardest part is remembering what you COULD do! However, realizing that it is time to make a change is huge and it looks like you are off to a great start! For me, I have always found that if I sign up for something, whether it's a fitness class, a run, or a bike ride, it gives me something to work on/towards! This might be a long one!! Want to come for a walk with me? Dairy Free Treats and a weekend review!!! Back to the land of blog! !